The second thought that crossed my mind was “What a short preamble, and they’ve left out the Chambers blurb.” A further perusal showed that the clues weren’t signified as Across or Down, so I guessed that a missing letter might be… but wait, that would spoil the fun. Addressing 1ac, I noted that Pock (an old setter in disguise?) was being kind to us by enumerating the answer before lipographical adjustment. Further across clue addressing revealed only 11 AUTUMN, 20 MANTILLA and 34 GUSSET (good old Gus, the theatrical cat to the rescue). Well, that was somewhat woeful! Despite the full enumeration, I had solved none of them. Luckily (or was it Pock’s generosity? ), 1dn came to the rescue with Were we crazy to smuggle turtle’s shell? (5). From the wordplay, it was likely to be MATED, but what was the definition? Aaaah, yes, we had to be delipographed to become wed! 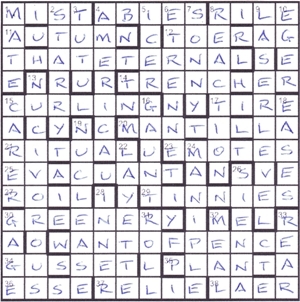 A quick scan of all the clues revealed, of course, that there wasn’t a D anywhere to be found, and any entry that lost a D had a D dropped from its clue before it made sense. After that, it was good fun to work out where the missing D was in each clue, or in two cases the missing DD. 8ac Mystery trip, taking in Germany, mile from Koblenz (6) led to RIDDLE with mile becoming middle, and 38ac Real ales, extra rum, bar opening — on means to get high (6) was LADDER, with ales becoming addles. (Bet Ms Curran had a fit when she read that clue! [Apparently she did. Ed.]) All lipographed words in the clues and grid became real words. My favourite clue was probably 26dn, Page from Merry Wives is turning yellowish-brown (6) for SIENNA (ANNE IS reversed, a reference to Mistress Anne Page in TMWoW). And so to the quotation: “T•ATE•ERNA• •ANTO•PEN•E” in rows 3 and 11. 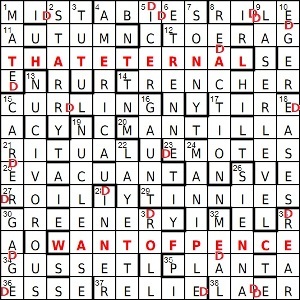 It looked as though it could be “That eternal want of pence”, reflecting the predecimal D that was missing from the puzzle. A quick check of my ODQ, which I bought with a book token given to me last Christmas, revealed… nothing! The only pence-oriented quotation was “Take care of the pence, and the pounds will take care of themselves”, a quotation from William Lowndes (1652–1724) and the resulting proverb (which lost the comma). Now, don’t ask me why, but my mind went back to the recent Listener, Xanthippe’s I-spy Choices, in which “clear these ambiguities” wasn’t in my new edition but was in an older one. Well, bugger me!! It was the same this week. There it is in my old 5th Edition, along with great swathes of Tennyson that have been expunged from my new 8th Edition. I wondered if the editors had asked setters to come up with themes based on quotations no longer in the latest ODQ. I wouldn’t put it past them. No, I wouldn’t! Thanks for an entertaining puzzle Pock, or should I say Paddock? I hope your next puzzle won’t be a lipogram: “a piece of writing, esp in verse, from which all words are omitted which contain a particular letter” (my italics). This entry was posted on 27 July 2018 at 4:00 pm	and is filed under Solving Blogs. Tagged: Pock, Vexatious Lipography. You can follow any responses to this entry through the RSS 2.0 feed. You can leave a response, or trackback from your own site.